If you're looking to learn to draw, one of the most cost-effective ways to become proficient is to take an online Udemy course. 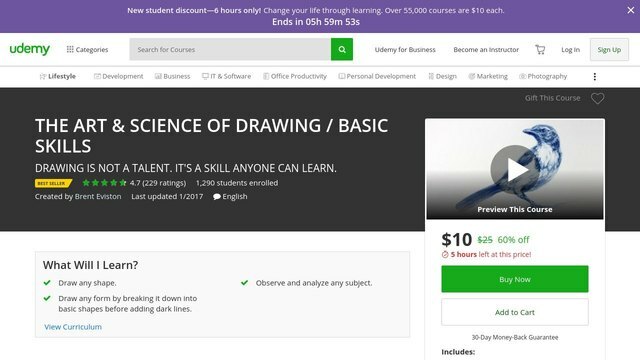 In this post we examine five of the most popular Udemy drawing courses and see if they live up to the hype. 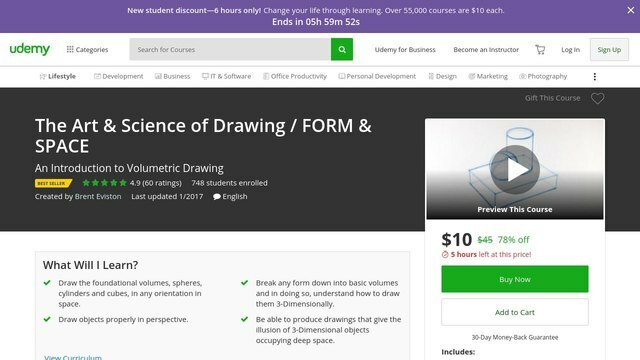 What is a Udemy drawing course? Udemy is a company that specializes in online courses that help people learn things such as design, art, programming and business. Most courses are a combination of videos and e-books (Source). If you want a basic drawing course that covers all the fundamentals, check out The Secrets To Drawing or the Art & Science of Drawing. If you're looking to polish your illustrating skills for a corporate business environment, check out the Drawings For Meetings, Presentations and Trainings. If you want to niche down into more advanced artistic methods, take a look at both Figure Drawing Foundations and the Art & Science of Drawing Form and Space. 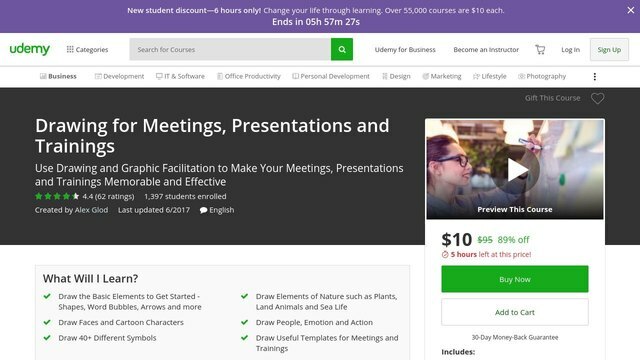 Udemy allows students to pick a course about a subject they want to learn and register for that course. Each course costs money, but most courses are reasonably priced. Each course has an instructor who teaches through videos and gives assignments. Courses can be taken at the users leisure. Buyers say there are plenty of good courses, but some bad ones mixed in as well and suggest that there are sometimes language barriers with some instructors that can be a challenge. Here we take a look at 5 drawing courses offered by Udemy. All of these courses are considered basic instruction and are what one would take as they start on the path to becoming a better artist. • The Secrets to Drawing — Very basic course that will benefit beginners as well as those who have been away from art for awhile. Reviewers say the instructor’s style is straightforward and easy to understand, although some criticized the course on perspective moving along too quickly to get all of the information. • Drawings for Meetings, Presentations and Trainings — This course is a bit different in that it’s geared more towards people who need to create graphics and artwork for the business world as opposed to someone interested in fine art. Students praise the quality of instruction and the ease of learning simple drawing. They cite very clear, repeatable instructions. Perfect for making meetings and presentations more engaging. • Figure Drawing Foundations | Proportions — Students should have a basic understanding of drawing principles and materials for this course. Focuses on properly drawing the human body in an anatomically correct and proportionally correct way. Student reviewers say the instructor did a good job of explaining the complex subject of proportions in a manner that was easy to grasp, however, some did note they felt the videos were too long despite being filled with good information. • The Art & Science of Drawing Form & Space — Good course on the fundamentals of drawing objects so they look real in relation to other objects and the environment in which they exist. The focus here is on cubes, cylinders and other basic shapes and making them look solid on the page. Students say the instructor is easy to understand and information is easy to grasp. Most people agree that having a good grasp of the fundamentals is vital for becoming a better artist (Source). • The Art & Science of Drawing Basic Skills — Emphasizes that drawing can be learned by anyone. A true beginners course that must be learned before becoming more advanced. Students praise the instructor for being thorough, yet easy to understand. Perfect for those with no formal art training. The Secrets to Drawing is a good option for anyone who is looking to improve their drawing skills. Students love how informative this course is, but some do complain about the instructor’s lack of charisma. The goal of this online drawing course is to learn the core concepts of drawing. The course is broken down into “easy to follow” and “easy to understand” segments and it includes drawing demonstrations and commentary. The course was designed by Matthew Fussel, illustrator and educator, who is also the founder and instructor at TheVirtualInstructor (website). This online drawing course might be a good choice if you are looking for drawing lessons that are presented in High Definition. In general, students have a very favorable opinion of the Secrets to Drawing course. They agree that the demonstrations are brilliant, as well as that the lessons are very informative. Students appreciate that the lessons are delivered in a very logical manner, with the right pace and style. Although the class is informative and educational, some students find the instructor to be not particularly engaging or immersive to listen to. In addition, many online reviewers complain that the instructor hasn’t answered the Q and A section for years. Some students add that periodic instructions to stop and practice would be helpful. If you’re looking for an online drawing course, you might want to consider The Art & Science of Drawing / Basic Skills. Students like the thoroughness of the lessons, but some do complain of the length of the course. This online drawing course is suitable for absolute beginners and intermediate level artists who want to improve their fundamental skills. The founder of the course, Brent Eviston, artist and instructor, states that the lessons give powerful insights into the drawing process and offer some of the clearest drawing instructions which are rarely seen outside of private art academies. This course could be a good choice if you are an adult or a determined teen who is interested in seriously pursuing art. In general, students state that The Art & Science of Drawing / Basic Skills meets their expectations. They agree that the lessons are very thorough, accompanied by clear explanations and demonstrations. Students appreciate the instructor’s great delivery, as well as that the assignments are manageable. However, there are complaints that the course is too short. Some students state that they wish there was a better/easier way to see the very light lines during the drawing demonstrations. If you are looking for a top-rated online drawing course, you might want to consider The Art & Science of Drawing / Form & Space. Students love the clear and concise instructions, and so far have no significant complaints. The goal of this course is to teach you how to draw different forms in any orientation in space, how to draw objects properly in perspective and how to produce drawings that give the illusion of 3-dimensional objects. It was designed by Brent Eviston, artist and instructor, who works for Artist Network. This course might be a good choice if you are an artist or an enthusiastic student who no longer wants their drawings to appear flat and lifeless on the page. The general student consensus concerning The Art & Science of Drawing / Form & Space course is that it is well thought out and demonstrated. Students appreciate clear directions and assignments that reinforce introduced concepts. They find the instructor to be very clear and concise. One student strongly recommends undertaking the course in chronological order with preceding courses offered by this instructor. In our research, we haven’t found any major complaint. One student says that the course could be improved by giving a little more instruction on “how to” make elliptical shapes at various angles. The Figure Drawing Foundations | Proportions could be a good option if you are a comic artist who is unable to keep the proportions of their characters consistent across multiple drawings. Students like that the lessons are easy to follow, but there are complaints regarding the length of some of the videos. This course is said to be an ultimate guide to avoiding the proportional mistakes most artists make. 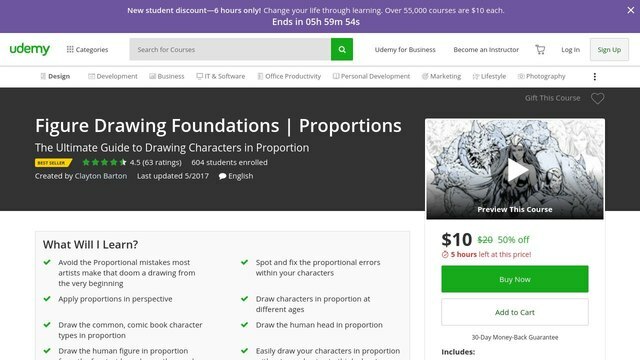 Its goal is to teach you how to easily draw your characters in proportion without even having to think about it, as well as how to spot and fix the proportional errors within your characters. The course was designed by Clayton Barton, who says that he is eager to teach aspiring artists all of his best strategies and techniques for Digital Illustration and Sculpting, Visual Design, and 3D Modelling. This online drawing course might be a good choice for comic artists who want to learn how to draw characters in proportion at different ages. In general, students have a good opinion of the Figure Drawing Foundations | Proportions and they conclude that it is an easy to digest course with simple explanations. Many online reviewers appreciate that it is well-structured with a theoretical part, followed by a concrete application of the delivered knowledge. Most of the students find the course to be quite informative and helpful. However, several students complain that some of the videos (especially the workshops) are a little long-winded. The Drawing for Meetings, Presentations and Trainings is a good option for trainers and teachers who would like to make learning more engaging and creative. Students like that the lessons are easy to follow, and so far have no major complaints. The goal of this drawing course is to show you how to use drawing and graphic facilitation to make your meetings, presentations, and trainings more memorable. Designed by Alex Glod, storyteller, trainer & TEDx speaker, the course is said to be of much assistance to video content creators who want to make whiteboard videos. This online drawing course seems like a good choice for presenters, leaders, and marketers who want to make their presentations more effective. The general student consensus concerning the Drawing for Meetings, Presentations and Trainings course is that it is well-structured and easy to follow. They agree that the presentation is excellent and the instructions very clear. So far, students haven’t stated any major complaint in their reviews. As you are probably already aware of, drawing is a kind of visual art form in which various drawing instruments are utilized to make marks and lines on paper or any other two-dimensional surface. Typical instruments used to draw are pen and ink, inked brushes, graphite pencils, crayons, charcoal, pastels, chalk, wax color pencils, different types erasers, styluses, various kinds of metals (for example, silverpoint), electronic drawing and markers. The way a typical drawing instrument works is by releasing a small amount of its material onto a two-dimensional surface, leaving a mark that is visible to the naked eye. The most commonly used medium to draw on is paper, although other materials are also frequently used to draw on, such as plastic, canvas boards, leather or cardboard. Drawings for temporary use can be drawn on a whiteboard or blackboard or almost any other surface. Throughout history, drawing has been a popular and basic method of public expression, as it is among the most efficient and simplest ways to communicate ideas in a visual manner. In today's world, with the easy availability and access to drawing instruments, drawing has become an extremely common artistic activity for people who are artistically inclined. Apart from drawing for artistic expression, drawing is also commonly used for other purposes, such as for technical drawings, engineering schematics, architectural designs and commercial illustrations. A sketch refers to a quickly made freehand drawing which is not intended to be used as a finished product, but rather, to convey an idea in a quick and convenient way. A person whose profession demands technical drawings to be made is referred to as a draughtsman, draftsman or a drafter. Just like artistic painting, emotive drawing puts emphasis on expressing and exploring various kinds of emotions, moods, feelings etc. These are commonly portrayed in the shape of a personality. Drawings that are made as a result of personal experience or real life observations are referred to as life drawings. Also known as still-life drawing or figure drawing, life drawing is used to express all the various emotions and feelings that the artist feels upon observing whatever is the topic of the drawing and then trying to capture those feelings and emotions in a picture. The most enduring theme of life drawing is that of the human body and it is applied in all sorts of areas, from sculptures to portraits to cartoons to medical illustrations, among other fields. As previously mentioned, sketching is a way of quickly drawing something that expresses the thoughts of the artist at a specific point in time. This is why sketches are typically rough, loose and freehand drawings and are not considered to be finished pieces of art. Sketchings are a result of the visualizations of the artist and the rapid rendering of those ideas onto paper. Analytic drawings are sketches that are developed for a clearer and vivid representation of the observations of an artist. Simply put, analytic drawing is done to divide an observation into smaller parts so that the viewer can get a better idea of the overall idea that the artist is trying to express. Geometric drawing involves drawing real-life plans and schematics according to scale and with proper dimensions and measurements used to display designs of an object or building. This is why geometric drawings are most commonly used in the field of construction, as drawings of various buildings and other structures need to be drawn according to scale and with all the proper measurements of all aspects. Artists use perspective drawings to represent three-dimensional images onto a two dimensional surface such as a piece of paper. Perspective drawing can allow an artist to represent volume, distance, space, scale, and light as if they are being viewed from a specific eye level. When an artist wants to investigate and explore new concepts and ideas, he/she can represent them on paper through diagrammatic drawing. These diagrams are drawn to represent happenstances and adjacencies that are most likely to occur in the near future. Therefore, diagrammatic drawings can be used to help in the design processes for any ideas thought up by the artist. When a drawing is drawn to illustrate the layout of specific documents, it is known as an illustration drawing. Illustration drawings include all the essential details of a project such as size, style, character, effect, color, etc. This is the most basic type of pencil art technique and is typically referred to as a 'heavy outline' or a 'light outline'. In a 'light outline' pencil drawing, the artist creates simple outlines that define the guidelines for the subject of the drawing, using a free-hand drawing technique or a ruler for more precise drawing. To design a light outline, all you need to do is to lessen the pressure of the pencil as you press it down onto the paper and proceed to draw in a slow and non-deliberate manner. In my personal experience, I have discovered that holding the pencil at an angle that is acute in regards to the top of the pencil while facing the direction in which you are drawing, while pulling back slightly, helps to make the flow of drawing a lot easier. Heavy outline pencil drawings are used to produce the final form of the drawing that puts emphasis on each part of the drawing. After you have drawn whatever it is that you are drawing, you need to make the lines 'heavier' by putting more pressure down on the paper as you redraw the lines, thus making the lines almost impossible to erase. Typically, heavy outlines are free-hand drawings and are designed by firmly holding the pencil close to the nib in order to have more precise control over the flow of the drawing and the increased pressure will allow you to provide the desired amount of shade or lack thereof. Using small pencil strokes while drawing heavy outlines will also help a lot in preventing mistakes of any kind. 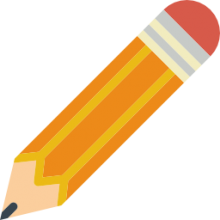 By gripping the pencil close to the nib, you will have a lot more accuracy and control over the lines you draw, however, holding the pencil too close to the nib can hinder you as well by obstructing your view of the lines directly underneath the pencil. 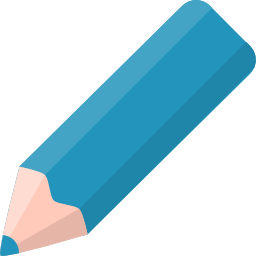 Thus, you should practice drawing straight lines using both heavy outline and light outline techniques, and with enough practice, you will be able to determine which position to hold the pencil in, in order to get the straightest lines. The 'Hatching' pencil drawing technique simply refers to a method of drawing in which you mark out small lines that are close to each other in order to create the illusion of filled colored spaces when viewed from a distance. This technique is a form of a shading technique, and just like the heavy or light outline techniques, you can add or lessen the pressure on the pencil to make the drawing according to your specifications. The cross-hatching drawing technique is very similar to the above-mentioned hatching technique. The only difference is that you draw the drawing in the opposite direction on a second layer that is on top of the first layer. This is also a type of a shading technique and is a great way to add darker shades to your pencil portraits as it allows you to add multiple layers on top of each other. However, I would personally advise you not to use this method if you desire to blend the pencil's graphite. The 'Stipping' pencil drawing method uses a concept that is similar to hatching, however, the lines are not one part. Instead, they are more in the form of small dashes that combine to form the illusion of unbroken lines. This is another type of shading technique which is suitable for drawing precise and small objects, such as the iris of an eye or facial hair such as stubble or eyebrows. Stipping is a great method if you use light pressure while drawing. This is most likely the first drawing technique you learned as a small child in school when you first started learning how to draw. In this technique, you simply move the pencil in a back and forward motion at a rapid speed in the same direction for every stroke. Similar to the above-mentioned methods, you can simply increase or decrease the pressure that you put on the pencil to create heavy or light shades. This method of drawing is very useful when you need to draw near the outlines of the object that you are drawing. This also ensures that all of your pencil strokes stay within the required area and do not stray outside the outlines. The last drawing technique that I will mention here is the 'Scumbling' pencil drawing method. In this method, you just move the pencil in tiny and circular motions, all the while keeping the strokes compact and tightly compressed together. This method is best when you need to keep the shading as light as possible and the various lines and shades all combine to blend together in a way that is pleasing to look at. This particular drawing technique is my personal favorite as I prefer to keep the graphite to have a soft impact on the canvas paper and the tones blend together to form a smooth texture.